Diminished eyesight is a growing problem – especially among aging American adults. Approximately 142 million U.S. citizens 40 and older have vision problems and by age 75, the American Academy of Ophthalmology indicates 70 percent of adults will develop cataracts. This occurs when the lens of your eyes become cloudy from age, poor eye health, and environmental factors; resulting in blurred, dim, or discolored vision and even blindness. Maintaining senior eye health is increasingly important as we age and the caregivers at FirstLight Home Care are committed to helping seniors with their vision difficulties. Wear sunglasses: One of the reasons June is Cataract Awareness Month is the summer sun and the damaging effects it can have on one’s eyes. Ultraviolet radiation can affect your eyes in a similar fashion as it can your skin; the Sun’s rays can burn your corneas and other area of the eyes in much the same way that sunburn can damage your skin. . Sun damage to your eyes may not show immediate effects; however, it can break down the lenses in your eyes through long-term exposure. Wearing sunglasses that are 100 percent UV-absorbent is an easy way to help slow the possibilities of developing cataracts. Limit cigarettes: Heavy smokers are at a much higher risk of developing cataracts compared to non-smokers, so try and limit your exposure. The free radicals in tobacco smoke that irritate your eyes are also damaging to the lenses in your eyes. In addition, your body’s antioxidant count is diminished when you smoke, lessening the strength of your eyes and increasing the chances of developing cataracts as a result. Get nutrients: A poor diet can go a long way toward poor well-being – especially when it comes to your eyes. A lack of vitamins C and E, beta-carotene and selenium will increase your chances of developing cataracts as will diabetes. Your eyes’ lenses get their nutrients from a fluid secreted from the ciliary epithelium – aqueous humor – and when you don’t have control over your glucose levels, the amount of sugar in the fluid increases, causing the lens to swell. This is why it’s important to eat nutrient dense foods like leafy greens and colorful fruits and vegetables. Taking stock in senior eye health doesn’t have to be difficult, it simply takes a few little things here and there to live with better sight. Encouraging your loved ones to do the same can help them age healthier and more comfortably. 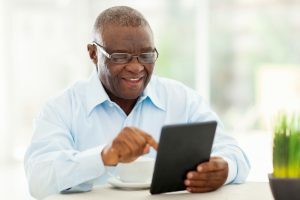 If you have a question about preventing cataracts for the seniors in your life, or other topics related to caregiving, contact our “Just Ask FirstLight” service today to get answers from one of our experienced health care professionals.